Subject-Oriented : A data warehouse can be used to analyze a particular subject area. For example, "sales" can be a particular subject. 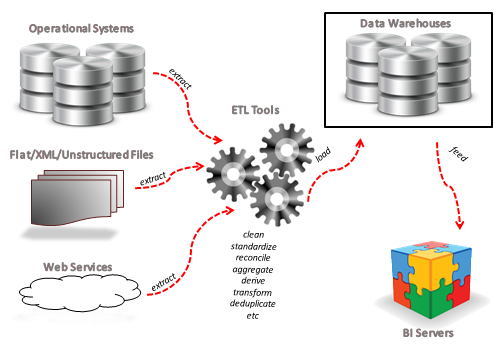 Integrated : A data warehouse integrates data from multiple data sources. For example, source A and source B may have different ways of identifying a product, but in a data warehouse, there will be only a single way of identifying a product. Time-Variant : Historical data is kept in a data warehouse. For example, one can retrieve data from 3 months, 6 months, 12 months, or even older data from a data warehouse. This contrasts with a transactions system, where often only the most recent data is kept. For example, a transaction system may hold the most recent address of a customer, where a data warehouse can hold all addresses associated with a customer. Non-Volatile : Once data is in the data warehouse, it will not change. So, historical data in a data warehouse should never be altered. This is a functional view of a data warehouse. Kimball did not address how the data warehouse is built like Inmon did; rather he focused on the functionality of a data warehouse. A database, typically very large, containing the historical data of an enterprise. Used for decision support or business intelligence, it organizes data and allows coordinated updates and loads.